Heinz-Harald Frentzen (born 18 May 1967), nicknamed "HHF", is a German former racing driver. He finished runner-up in the 1997 Formula One World Drivers' Championship, driving for Williams. Frentzen was born on 18 May 1967 in the West German city of Mönchengladbach (North Rhine-Westphalia) to Heinrich-Harald Frentzen, a German entrepreneur and his Spanish wife Angela Lladosa. He has two sisters, Sylvia, a theologian, Sonja, a teacher and two half-sisters Samantha, a former student and Nicole-Nadine. His family was connected to motorsport; his father raced between 1950 and 1957. Frentzen's parents divorced when he was eight years old and his father subsequently married Mexican-born Arazelli while Angela returned to Spain. Frentzen began karting at the age of twelve, after his father brought him his first kart, and made an extraordinarily successful start. In 1981, aged fourteen, Frentzen won the German Junior Kart Championship. Two years later, Frentzen entered the CIK Asia Pacific Championships in Australia driving a Dino although he did not finish. In 1984, he finished runner-up in the 100cc class. He was funded and supported by his father—a funeral director—who also acted as both team boss and head mechanic. In 1986, Frentzen moved into car racing by entering the German Formula Ford 2000 series. After two seasons in Formula Ford he was runner-up in the 1987 series, despite not participating in all races. Frentzen progressed to German Formula Opel Lotus in 1988 in the Junior Team of former Formula One driver Jochen Mass, who had been impressed by Frentzen's performances in Formula Ford. Frentzen was champion of the German series in his first year and his teammate Marco Werner finished third in the championship. He also participated in the Formula Opel Lotus Euroseries, where he finished 6th in the championship, scoring 56 points. The next step was the German Formula 3 Championship in 1989, where Frentzen competed against many future stars including Michael Schumacher and Karl Wendlinger. At the time, there was a big push by Bernie Ecclestone to have a German driver in the Formula One World Championship, so the ONS (the German National Motorsports committee) decided to support both Frentzen and Schumacher. The ONS put up the reward of a Formula One test to the driver who first would take a victory in a Formula 3 race. This ultimately ended up being Schumacher, in a controversial race at Zeltweg, Austria in which Frentzen claimed Schumacher had forced him off the track. However, Schumacher did not get the Formula One test drive anyway; Karl Wendlinger won the German Formula 3 Championship and Frentzen became joint runner-up with Schumacher (the two finishing on identical points totals). In 1990, Frentzen entered the International Formula 3000 series driving for Eddie Jordan Racing and was partnered by Eddie Irvine. Frentzen finished the season 16th in the championship, scoring 3 points. In the same year, he also participated in the World Sports Prototype Championship driving a Mercedes-Benz C11 scoring one podium and six points. In 1991, Frentzen continued to drive in International Formula 3000, moving to Vortex Motorsport and scored five points in that year's series. In 1994 Frentzen was given a Formula One drive by Peter Sauber in a Mercedes powered car, as teammate to Wendlinger. His driving impressed Frank Williams, who asked him to replace Ayrton Senna at Williams after the Brazilian's death, but Frentzen chose to remain with Sauber, and his performances helped to maintain the team's momentum after Karl Wendlinger was seriously injured at Monaco. The following year in the now Ford-powered Sauber he got his first podium finish at the Italian Grand Prix and ended the year 9th in the Drivers Championship. However, the 1996 Sauber was unreliable, with many races ending in retirements and Frentzen dropping down the order, though he was one of only four drivers running at the end of that year's chaotic, rain-soaked Monaco Grand Prix. The race was won by Olivier Panis. For the 1997 season, Frentzen replaced Damon Hill at the Williams-Renault team that had won the drivers' championship three times since 1992. At the first race of the season, the Australian Grand Prix, Frentzen took the lead at the first corner and remained there until his first pit stop. He was running second late in the race when a brake disc exploded, throwing him off the circuit and into retirement. He took his first win at San Marino but the season was disappointing for him; after the family atmosphere at Sauber, Frentzen found life at Williams difficult, in particular having a troubled relationship with Patrick Head. Despite qualifying for many races on the front row he had a tendency to drift back in the race, usually finishing well behind teammate Jacques Villeneuve. However, because of Michael Schumacher's disqualification from the driver's championship Frentzen ended up second in the championship with 42 points to teammate Villeneuve's 81, having scored one win to Villeneuve's seven. The next year Williams lost the works Renault engine, instead using a rebranded version called Mecachrome. Williams also lost chief designer Adrian Newey to McLaren. Consequently the team suffered a loss of form. Nevertheless, Frentzen finished third in the seasoning opening 1998 Australian Grand Prix. However, McLaren and Ferrari dominated the season, and Williams struggled to keep pace. The race in Australia was the highlight of Frentzen's year as the Williams lost pace. He ended up with 17 points, with his teammate on 23 points. Frentzen and Villeneuve were replaced by Alex Zanardi and Ralf Schumacher for 1999. 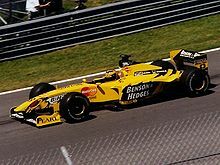 In 1999 Frentzen moved to Jordan in a straight swap with Ralf Schumacher and enjoyed success in the Mugen-Honda powered car, with two race wins and scoring points in the majority of races. Frentzen finished third in the Driver Championship and was regarded by many[who?] as the driver of the year. After the strong season Frentzen was considered as a favourite to challenge for the championship in 2000. Frentzen driving for Arrows at the 2002 French Grand Prix. 2000 and 2001 were critical years as Honda also began to supply the BAR team, resulting in a race between the teams as to who would secure the regular engine supply. In 2000 Frentzen managed two podiums, which were the best results for the team, but Jordan still finished down the grid and, crucially, behind BAR. After some low points finishes, injury, disagreements about the technical direction of the team (Frentzen reportedly offered to pay for the changes to fix the car, out of his own pocket) and then a string of retirements halfway through the 2001 season, Jordan sacked Frentzen and replaced him with Jean Alesi. Frentzen took Alesi's place at the struggling Prost team, and managed to qualify fourth at Spa, before the outfit collapsed financially at the end of the season. Frentzen driving for Sauber at the 2003 French Grand Prix. 2002 saw Frentzen drive for the Arrows team. He scored points on two occasions and outpaced both the Jaguars who ran the same engine. But the team went bankrupt in August and Frentzen was released from his contract. Back with Sauber for 2003, after a one-off drive replacing Felipe Massa at the 2002 United States Grand Prix, Frentzen was evenly matched with his highly rated teammate Nick Heidfeld and scored a podium finish in the penultimate race of the year in the United States. Frentzen driving for Audi (Abt) in the 2006 DTM season. For 2004, Frentzen moved to the German Deutsche Tourenwagen Masters saloon car series to drive for Opel, encouraged by the success achieved in the series by fellow F1 refugee Jean Alesi. However, his Opel Vectra was not a competitive car, and he was regularly outpaced by not only the Audi and Mercedes drivers but also by his Opel teammates, eventually finishing the season 14th in the championship standings. However he remained in the DTM with Opel for the 2005 season and finished the year in 8th as best-placed Opel driver, with his best result a 3rd place from pole position at Brno in the Czech Republic. After Opel withdrew after the 2005 season, Frentzen joined Audi for 2006. He would finish 3rd at the first race of the season at Hockenheim and again at the 8th race of the season at Barcelona. Frentzen finished the season 7th in the final standings and quit the team stating he had "no support from the team". In April 2008, Frentzen drove the Bahrain race in the Speedcar Series of the 2007/2008 season and later on joined the Speedcar Series for the complete 2008/2009 season. He competed in the 24 Hours of Le Mans for Aston Martin Racing driving one of the two factory Aston Martin DBR9s with Karl Wendlinger and Andrea Piccini in the GT1 class. His team finished 4th in class and 16th overall. Also in 2008, Frentzen built the HHF Hybrid Concept Car which he entered in the 24 Hours Nürburgring with his own Team. The chassis was a bought Gumpert Apollo road car with a 3.3 litre V8 bi-turbo with 520 hp and an electric motor with approximately 136 hp. Frentzen finished the race but was not classified due to two conventional gearbox failures. In 2011, Frentzen won a special one-off 'ROC Legends' race against Hans-Joachim Stuck, Marc Duez and Stig Blomqvist as part of the 2011 Race of Champions. In 2012, Frentzen competed in the ADAC GT Masters season with a Callaway Competition Corvette Z06, and returned to the series in 2014 with a HTP Motorsport Mercedes-Benz SLS AMG GT3. Frentzen has been described as a "loyal" driver. The monthly magazine F1 Racing noted that the key issue for Frentzen was finding the appropriate settings for his car which was done by himself. In his autobiography An Independent Man, Eddie Jordan said that Frentzen did a "great job" at driving the Jordan 199. After leaving Sauber at the end of 2003, BBC Sport described Frentzen as a driver who "never quite made the most of a brilliant natural talent." However, Sauber team principal Peter Sauber said in 2005 that Frentzen was the most important driver for his team but admitted that the driver need to work in a specific atmosphere and referred to his time at Williams where he was in conflict with technical director Patrick Head. ‡ A non-championship one-off race was held in 2004 at the streets of Shanghai, China. Euro Racing Charles Zwolsman, Sr.
^ von Lorentz, Frank (4 April 2004). "Ein Mädchen gibt Vollgas" [A girl goes full throttle] (in German). Die Welt. Retrieved 22 October 2014. ^ "Frentzen: The man behind the wheel". BBC Sport. British Broadcasting Corporation. 25 July 2001. Retrieved 22 October 2014. ^ Phillips, Sean (10 December 2013). "The 1983 CIK Asia Pacific Championships". KartSportNews.com. Retrieved 22 October 2014. ^ Вице Чемпионы формулы 1: Хайнц-Харальд Френтцен [Vice champion of Formula 1: Heinz-Harald Frentzen] (in Russian). avtosport.com. Retrieved 23 October 2014. ^ "Drivers: Heinz-Harald Frentzen". GrandPrix.com. Retrieved 12 August 2015. ^ Tremayne, David (8 September 1996). "Quiet man's noisy arrival". The Independent. Retrieved 12 August 2015. ^ Williams, Stewart. "When Williams ruled Formula 1". F1 Racing (February 2009): 68. ISSN 1361-4487. ^ Jordan, Eddie (2007). An Independent Man: The Autobiography. London, England: Orion Publishing. p. 292. ISBN 9780752875347. ^ "Heinz-Harald Frentzen". BBC Sport. Retrieved 12 August 2015. ^ Bishop, Matt. "Everything is Fine". F1 Racing (September 2005): 61. ISSN 1361-4487. Wikimedia Commons has media related to Heinz-Harald Frentzen. This page was last edited on 4 April 2019, at 09:02 (UTC).